Good morning! I have a great before and after post today that really shows the magical transformational abilities of paint. Even though I pretty much paint furniture every single day, there are times when I get blown away by what a difference paint makes. Lou came to me and asked if it was worth having me paint their bedroom furniture. I said "definitely". The furniture is all solid timber and well made. The bed was a vintage mahogany bed that they had changed to a king bed. The bedsides were Balinese mahogany and Lou didn't love them but for what I charged her to paint them it was much cheaper than for looking for new ones, and once they were painted they would match the bed anyway. The bed had a split to the timber along the foot of the bed that you can see in the photo above. I used metal brackets to strengthen and stabilise the join. These brackets will be hidden by the mattress so it didn't matter about it not looking perfect. On the outside part that is visible, I used a little timber glue and sanded the join smooth. Once it was painted it was not noticeable at all. The colour we chose was a pale taupe. It's really stunning in real life - I had a hard time photographing it in the less than perfect light of my studio. An interior designer had given my client a sample and I had Michelle at Porters Paints Leichhardt match it with one of their paints. I used a satin enamel as my customer didn't want a waxed finish near her sheets. With water based enamel paints, I find you really have to watch your painting technique as it is prone to sagging and dripping. If you are used to painting with chalk paint then you will find aqua enamel a lot more challenging and I would practise on a spare piece of timber before painting your furniture. You might find it easier to paint each surface flat rather than vertical. Porter's Aqua Enamel (as like other brands) is a water based acrylic enamel, that dries to an extremely hard wearing finish that provides all the benefits of an oil based enamel with none of the drawbacks. It is self leveling (which means it eliminates most brush marks but also means it's prone to sagging when drying), non-yellowing as it's water based and doesn't contain alkyds. It is also much faster drying than oil based enamels. Aqua enamels is the paint that I recommend for cabinetry such as kitchens, bathrooms, doors and trim. I also love Dulux Aqua Enamel (Semi Gloss) and Taubmans water based Trim. They are all very hard wearing and fully washable. 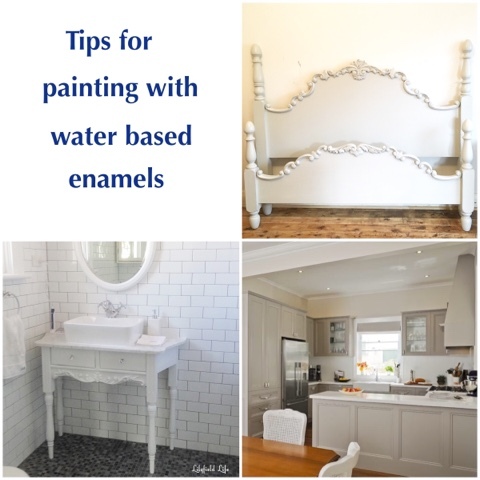 When using a water based enamel you will need to prime your piece if it's not previously painted or you will need to lightly sand your piece just to create a keyed surface. Then you will need two coats of paint but you do not require a top coat. I also sand between coats for a beautiful smooth finish but that's up to you on what you want to do - it's not 100% necessary depending on how fussy you are )i'm very fussy). For this bedroom set, I lightly distressed the finish to bring out all the details. You will have to work harder to distress than if you had painted using chalk paint. When distressing satin enamel you also have to be very careful to not ruin the sheen of the paint. The bedroom furniture now looks like a proper set and my customers were just delighted. Paint is a great way to update and unify mismatching furniture. That paint finish and transformation is beautiful. Thanks for generously sharing your tips Fiona. Your work is as beautiful as ever. Quick question, what grit sandpaper would you recommend for sanding aqua enamel between coats. I'm aiming to paint my kitchen after having seen your stunning kitchen last year. Love the new look. So lovely!